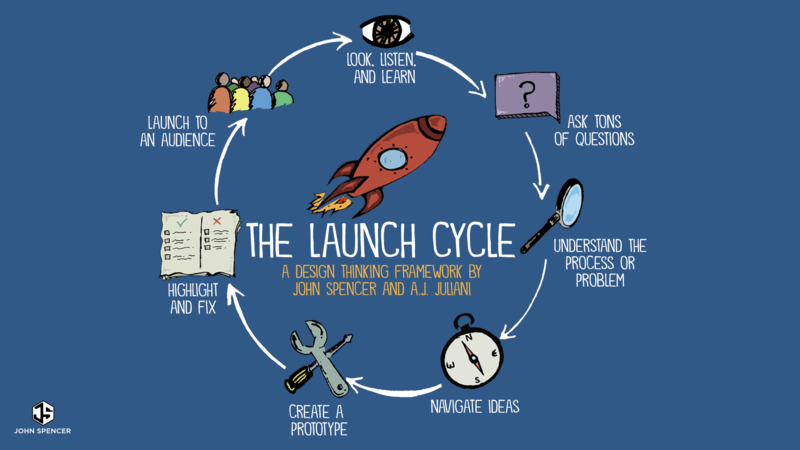 So, here’s a description of the design thinking cycle that AJ Juliani and I developed and included in our book Launch: Using the Design Thinking Process to Boost Creativity and Bring Out the Maker in Every Student. Note that we added a final phase that’s often missing from design thinking models. It’s the idea of launching. It’s the belief that after students have designed their work, they should send it to an authentic audience. Please leave your email address below and click the yellow subscribe button to receive the free design thinking toolkit. It includes a free design thinking project, an eBook, and a suite of assessments. I will also send you a weekly email with free, members-only access to my latest blog posts, videos, podcasts and resources to help you boost creativity and spark innovation in your classroom.